A former University of Southampton student has been awarded the Queen's Medal after completing his army officer training at the Royal Military Academy Sandhurst. Eddie Brecht, who graduated from Southampton last year with a 2:1 in History, was presented with the award by Chief of the General Staff, General Sir Peter Wall, after being commissioned top of his intake in the Queen’s Order of Merit. 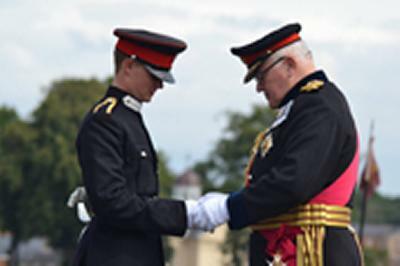 The Queen’s Medal is awarded to the British Army Officer Cadet who has achieved the highest scores in military, practical and academic studies. “I am delighted to have won the Queen’s Medal and believe it is in no small part a testament to the development, both academic and character-wise, that I underwent while at University of Southampton,” says Eddie, who was a member of the University Officer Training Corps and played for the University rugby and hockey teams. Having completed his officer training at RMA Sandhurst with flying colours, Eddie will be commissioning into the Parachute Regiment, based in Colchester.